Understand taxes? Like local option? When support tax increases? Our respondents weigh in. 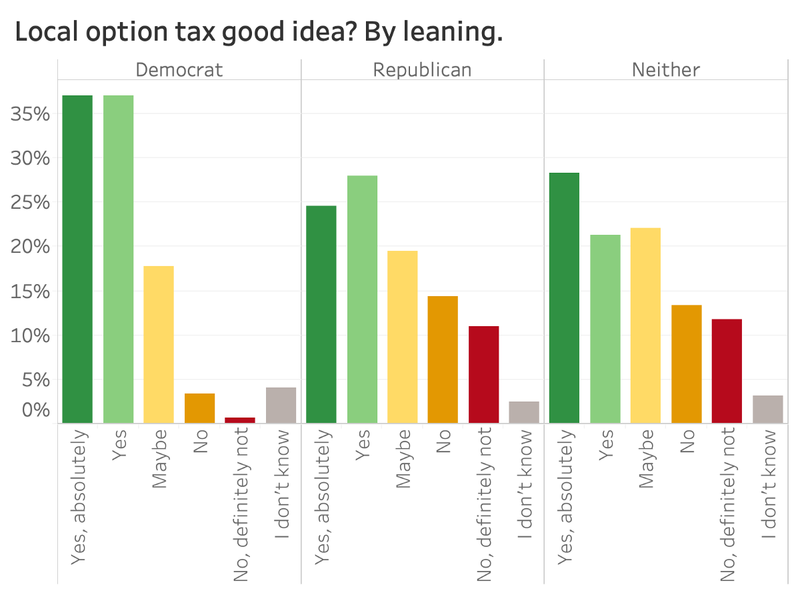 Local option tax was popular across the board, whether you lean Democrat, Republican, or Neither. Our respondents generally think it’s a good idea. 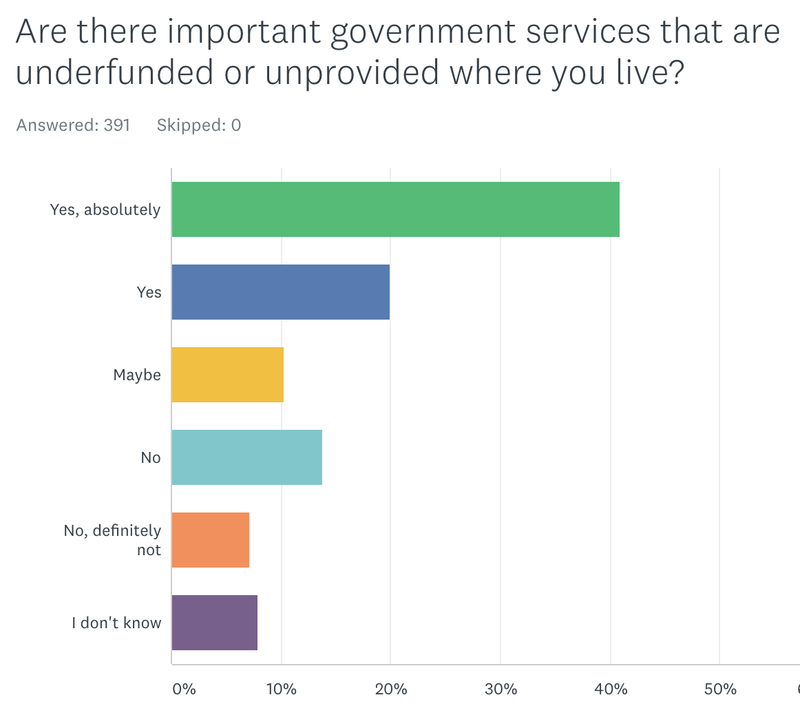 There’s a huge partisan divide on whether “important government services are under-funded or unprovided” where respondents live. I think this comes down to a fundamental difference in people’s idea of the government’s role in solving societal problems. We don’t understand Idaho taxes very well. 70% of our respondents said that, to be precise. And this number is probably higher for the general populace. I think the state should do much better here. Local option a good idea? It’s 2019, it’s tax-filing season, and it seems like every politician is talking budgets. Perhaps you’ve been thinking a bit more about how our state government is funded. It’s complicated, but it’s hugely influential on what our leaders can and can’t do to solve state and local problems. 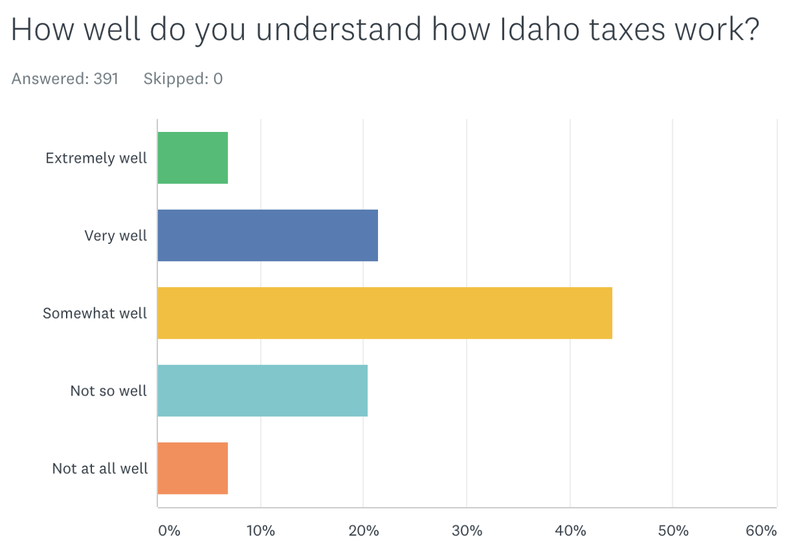 We wanted to know how people think about Idaho taxes. 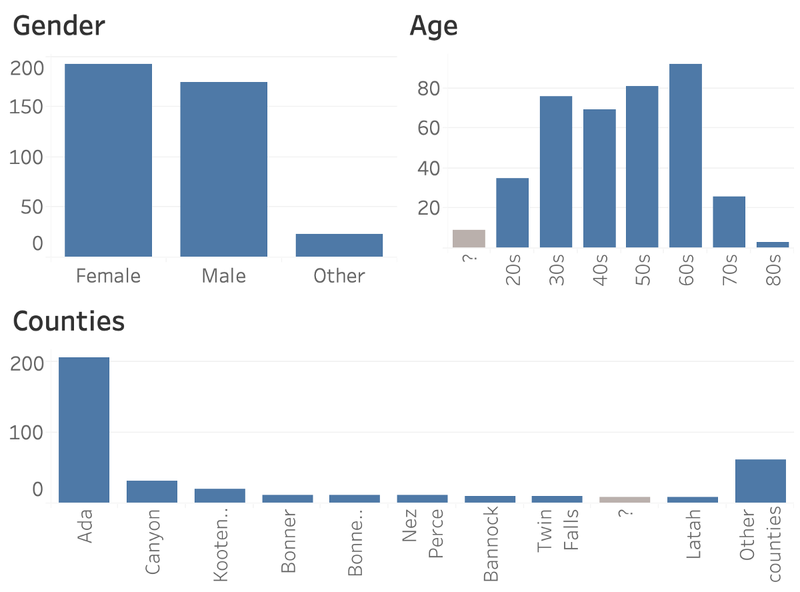 We had about as many men as women, we covered the age spectrum pretty evenly, and we heard from Ada county the most, but about half the responses came from outside Ada. Political party is probably the most important demographic when it comes to tax discussions, so I led with that question. We had a very even split on this. 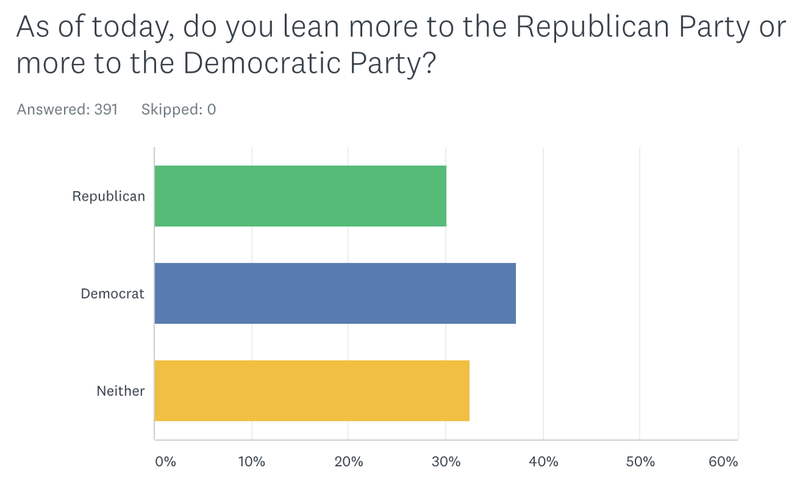 Almost equal thirds between Democrats, Republicans, and Neithers. I was very excited to see this, because on past surveys we’d heard from far more Democrats. And since we know each respondent’s county as well, it could be fun to see how red or blue each county was on average, based on the respondents we heard from. Interesting to see what the average political leaning was for our respondents by county. Definitely keep in mind the sample size for each (displayed on the left) — it’s very likely that many of the counties would be a different color if we heard from more people. Next up, I had a hunch that you might be more informed about tax policies if you own your home, since you pay property taxes and you’re less transient (in theory). 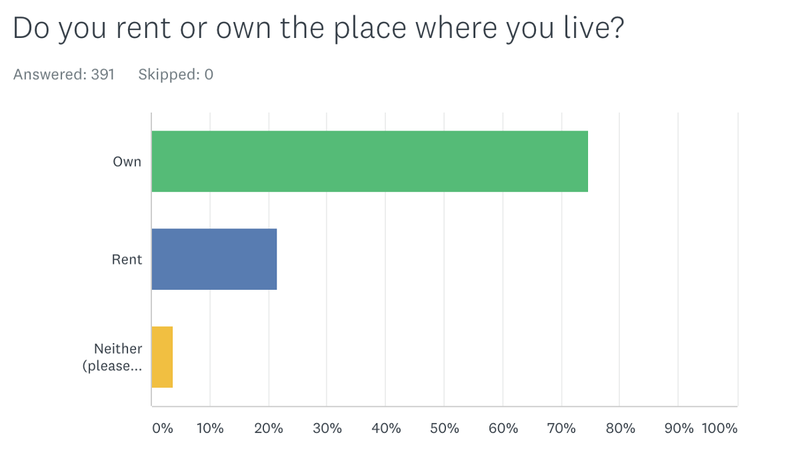 About 75% of our respondents are home owners, with 20% renting, and about 5% in some other situation. 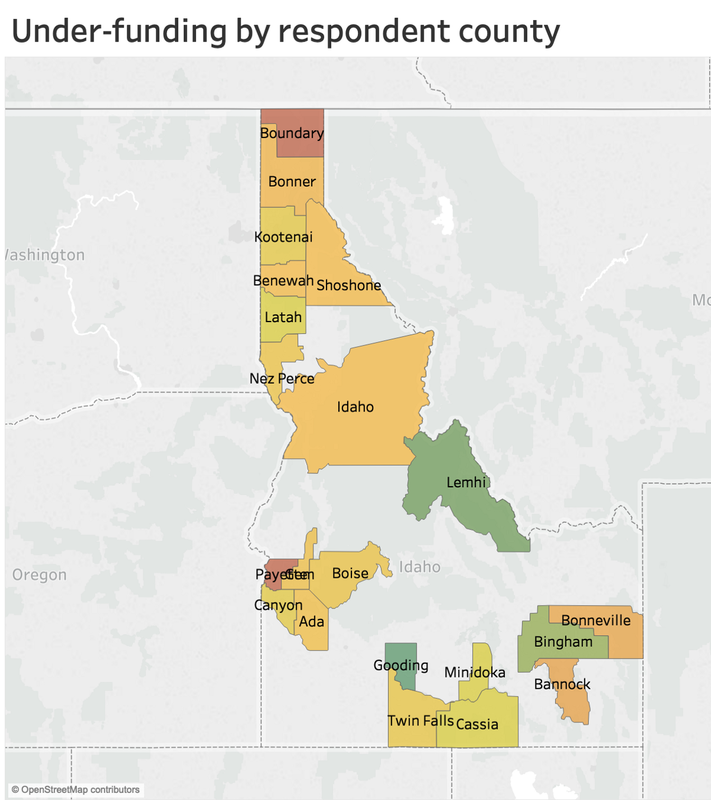 At first, 75% owning homes seemed quite a bit higher than the overall population might be to me, but when I looked it up on the Census site, it’s not much different — they’ve got 69% of Idahoans in owner-occupied housing. Interesting. Let’s check the county averages on this one too, for funzies. Alright, let’s get into the subject at hand — taxes. First off, I wanted to know how well people think they understand how Idaho taxes work. Overall, it was a very pleasing normal distribution, centered on “Somewhat well,” which had 45%. Then it was equal proportions for “Very well” and “Not so well,” both with 20%. And lastly, “Extremely well” and “Not at all well” rounded out the remaining 15%. The story is clear here. 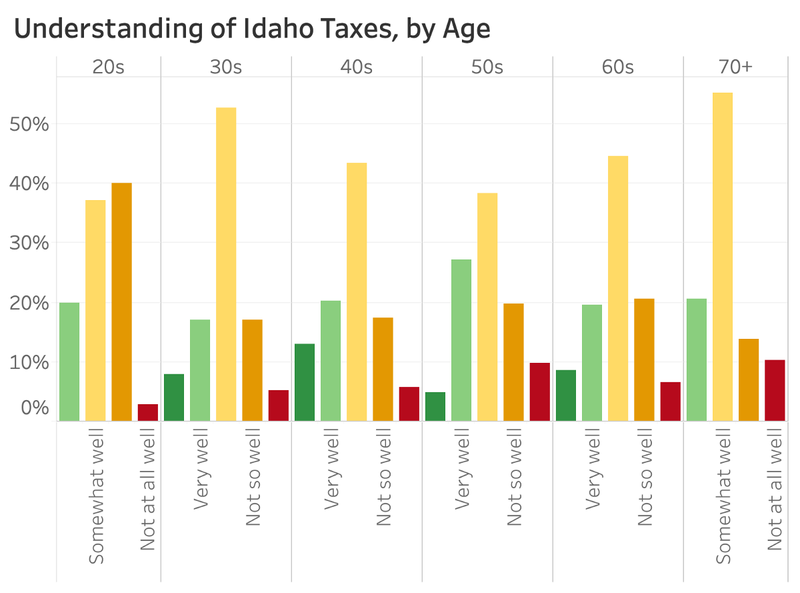 Most of our respondents don’t understand Idaho taxes very well (~70%). And I would guess that number is even higher for the general population since Make Idaho Better respondents are typically more engaged and tuned into state issues and policies. 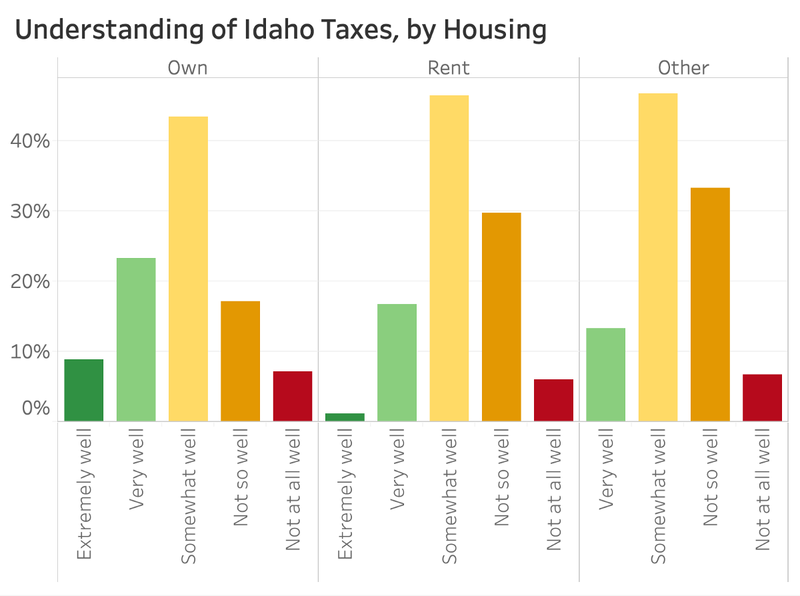 Now, I’m curious to test that assumption I mentioned early about whether homeowners are more knowledgable about Idaho taxes. Looks like that could be true, but not in a big way. “Extremely well” and “Very well” were both higher for home owners than renters. But still about 60% of our owner respondents don’t understand Idaho taxes very well. Next, I wanted to look at slices by age to see if older folks, who have been around longer and paid taxes more times, would feel like they have a better understanding. Not really. The proportions of the different age groups don’t look remarkably different, except for respondents in their 20s — they answered “Not so well” about twice as much as the other age groups. Now let’s try by political leaning. From my personal experiences, I’m used to conservatives having stronger opinions about taxes, so perhaps they understand it better. Nope. Looks like there’s pretty much no difference at all between Dems and Reps on tax understanding. 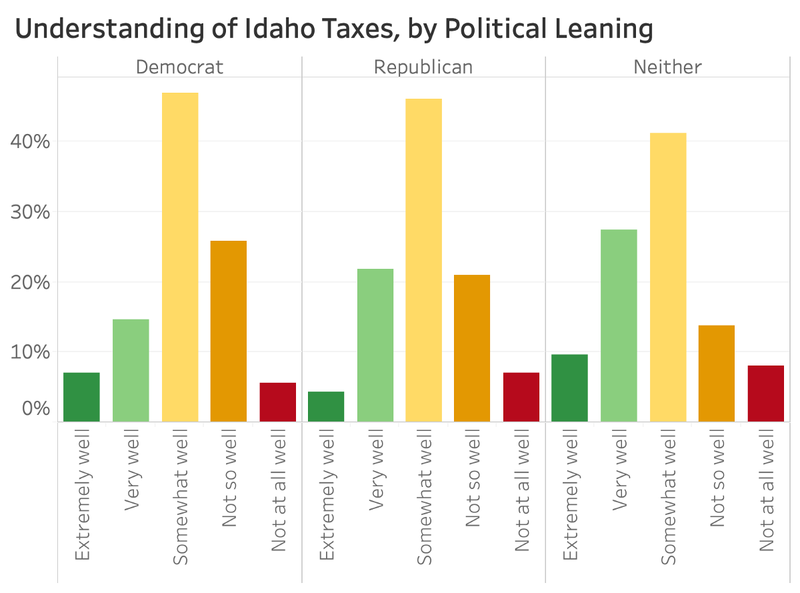 However, Neithers seemed to feel they understand Idaho taxes better than the other groups — “Extremely well” and “Very well” were both proportionally higher. Ok, now let’s talk about the things that taxes fund, services. 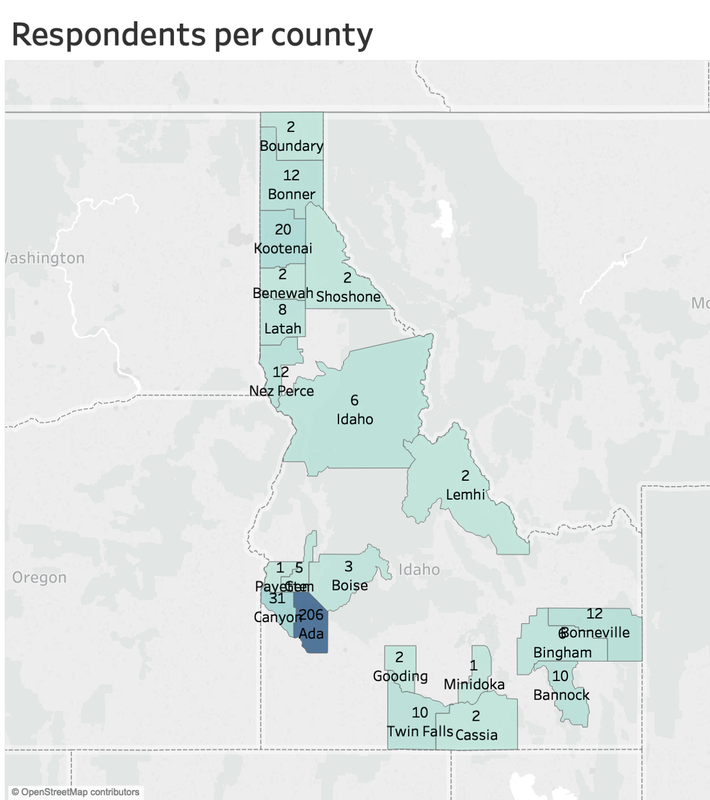 I was curious to learn if people feel like important services are underfunded or unprovided where they live, which could be anywhere in Idaho. The overall results show us that the “Yes answers” were the most popular, at slightly over 60%. “No answers” were only about 20%. Not too surprising to me, I feel like people always think they should be getting more bang for their buck than they currently are, but there’s also probably some real truth in this. Now let’s try segmenting this by the political leaning question and see where it takes us. This is the view that strikes me the most. Maybe in the entire analysis. Dems and Reps are very different on this question. 90% of Dems gave a Yes answer compared to 35% of Reps. On the other hand, 1% of Dems gave a No answer, compared to 35% of Reps. And Neithers were in between. To me this says that Dems and Reps have a different idea of what an “important government service” constitutes. In other words, they have different ideas about what types of things the government should be doing/providing. Maybe they’d agree on the issues, but the preferred solutions would be different. Now, as someone that lives in Boise, I’ve been hearing about LOT (local option tax) a lot. From my understanding, there’s basically no way for us to fix our traffic/parking/public-transit issues without it, but we’re currently barred from using it by the state legislature. So, I wanted to learn more about perceptions with it. Overall, most respondents were in support of the concept, as I articulated it. About 60% gave a Yes answer and about 25% gave a No answer. There was a big group that said Maybe (20%), so those could potentially go either way on this. Next, I wanted to look at this by political leaning. 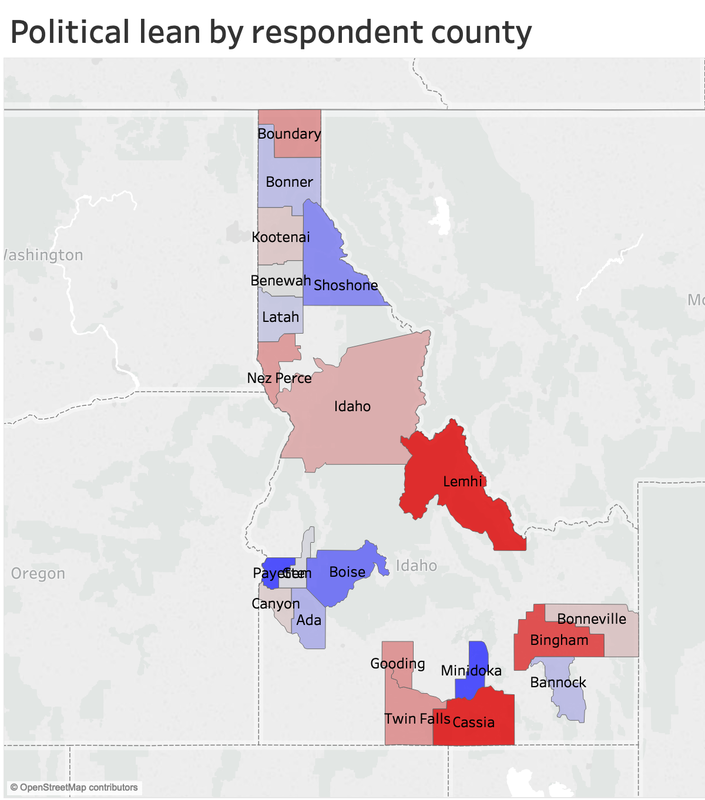 From what I’ve heard, rural Idaho Republicans are often opposed to local option tax, because it would give urban Idaho too much power (in their minds), or something like that. If that’s true, maybe we’d see Republicans favoring this less. 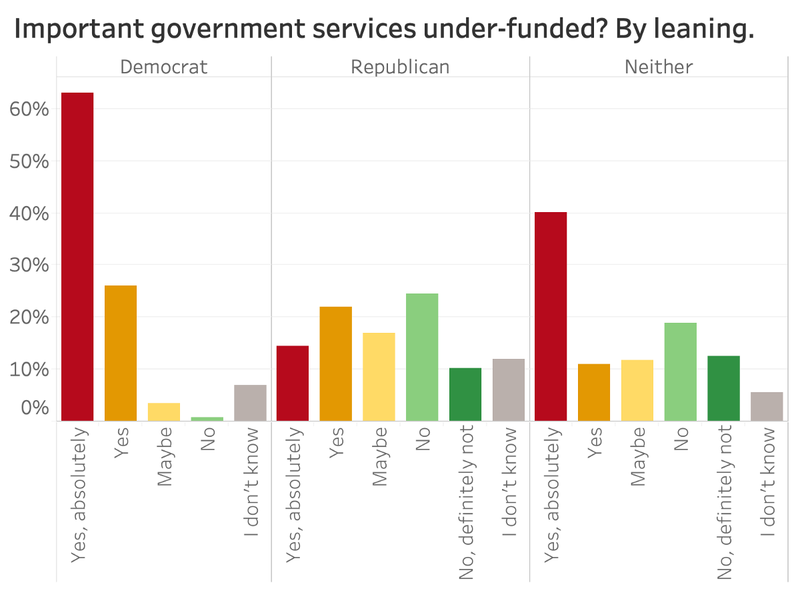 Yes, it does appear Reps favor it less, but not dramatically so, like we saw in the last question about important services being under-funded. However, within the Republican group, still 55% gave a Yes answer, compared to 25% giving a no answer. This doesn’t surprise me that much. From what I know about conservatism, self-determination and local control is usually a good thing. So, I don’t really see why conservatives would be opposed to this philosophically. And that was pretty much born out in these results. Now, let’s talk about my favorite question in this survey… basically, what would it take for you to support increasing your taxes? Who would need to be helped by the increase? I wanted to get a sense of how self-interested our respondents are or not. Overall, the weighted averages weren’t super different. There’s basically 3 groups: the top 2, the middle 3, and the bottom 1. 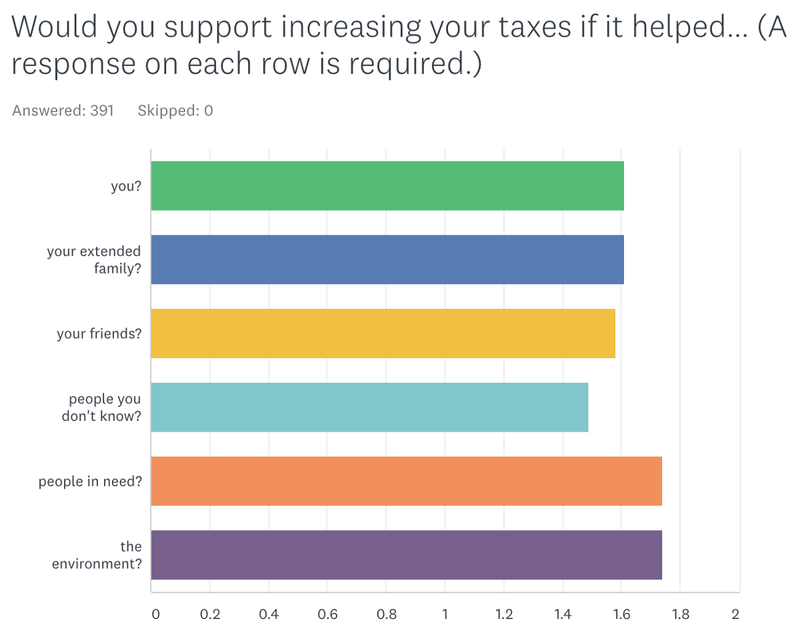 Tax increases were likely to get the most support if they help people in need or the environment. On the other end, if it helped “people you don’t know,” it was the least popular. The middle groupings were all the “your people” options: you, your family, your friends. This was intriguing to me. I had expected taxes that helped “you” to be most popular, but that wasn’t true. I’m guessing many of the folks we’ve heard from are well-enough off financially that they feel like they don’t need the help, but they know others do. Let’s look by political leaning. Damn! It’s like the “important government services” chart above. Look how different Dems were than Reps! Virtually all Dems support increasing taxes if it helps any of these groups. And they REALLY, REALLY supported increases if it helped those in need and the environment. 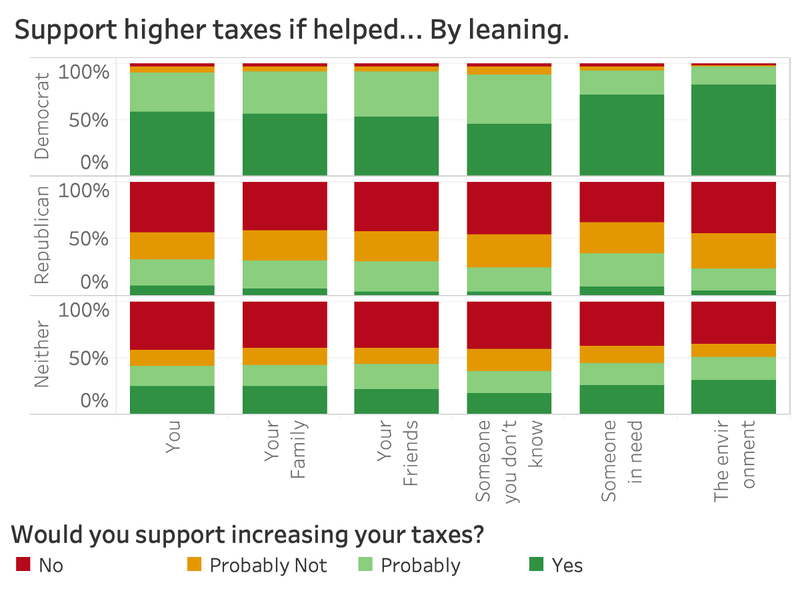 Republicans weren’t really in favor of increasing taxes in any scenario, but were the most likely to support them if it helped someone in need. Also, I expected taxes for the environment to be less popular with them than it was — basically not much different than the other ones. And Neither’s were closer to 50/50 on whether to support tax increases in each category, tending slightly towards not supporting. They are too high. People that claim ID taxes are too high haven’t seen a tax bill from OR, WA or CA. Safety (Fire, Police). Glad to hear all the Idaho Legislators and new Governor are supporting education and Medicaid expansion this session — but will there be enough money? Schools. School levies are voted on by every voter but they only affect property owners. I think only property owners should vote on these levies. If school administrators would use the funds wisely, then they would have plenty of money for teacher salaries and the students. Stop the waste and get back to traditional teaching. Idaho, especially on a local level, is increasingly spending too much money on things that government wasn’t intended to do. People in the county being taxed for city entities only city residents allowed to use. Funding roads as a means to mitigate congestion. This will not work. Public transit will, but it requires public funding. Local option tax could help with this, widening roads will not. How much we spend or don’t spend on education. Idaho spends almost half as much in education per student than Oregon but our graduate rate and overall school ratings are similar. This points to the fact adding more money to the education system does not equal better results. Furthermore Idaho does a great job of adding new schools when needed. Oregon rarely builds new schools even though their budget is much higher. That said. Education is very important and if someone proves that something in education needs additional funding then it should be done. The need for tax cuts. State government has been rendered ineffective by the continuous tax cuts over the last 25 years. For some reason, people get bent out of shape when they have to pay taxes, Hence the “taxation is theft” motto. I don’t understand how they think roads get built and maintained, fires get put out, the grove plaza exists, etc etc without money to fund it! The idea that wealthy people should pay less in taxes as an incentive to “create jobs.” This has been proven wrong again and again yet people still trot out the same talking point to protect a group of people that they will never be a part of. Big Flashy developments, or projects, we don’t need them. We need to grow organically. Stop giving tax breaks to corps. Education is a money pit. They get plenty and waste it. Too many people scamming the system and qualifying for assistance. Sadly my own son may become an example. We don’t want him on social security but many of his friends have flunked the social security tests on purpose to qualify. Now my son plans on doing the same. This trend has ruined his work ethic. He is 18 and has support of the social worker at his high school. He is fully capable of working. The option to “just get on welfare” is not good for society or the individual. We need to help people that are trying. I see too many young people struggling with multiple jobs and/or college. More help for those people. Local and state governments should make work more attractive and welfare less attractive. Medicaid, we need to look at more creative ways to teach people to be self-sufficient and only lean on Medicaid for a short time until they can get on their feet. Provide education and training on money management, job seeking, etc. Business tax gets far too much attention with the lie that lower business tax will lead to more businesses expanding and moving here. The truth is that businesses grow based on the capability of workers and the best solution for that is lifetime learning. Somehow equating low wage working poor community members as freeloaders, when their collective labor is what fuels this state. They work twice as hard for half as much, and then conservatives cry that they pay no taxes, when their annual income barely allows them to even pay need based expenses, much less set money aside for discretionary spending, retirement savings, large investments, etc. Within this framework, they should get all their tax withholding back and the tippy top earners should be paying a larger percentage of their top tier income to taxes, reinvesting back into the system that so heavily rewards them. The idea of “needs” at the multi-million dollar annual income is so selfishly rude when you watch a single income working mom with two kids hold down two part-time jobs (so the company doesn’t have to pay health insurance), manage the home, keep their kids engaged in extracurricular activities, and heaven forbid take some time for herself. Then, she’s a freeloader because she has to get her insurance on the exchange while her kids access medicaid… It makes me downright angry to within this awareness listen to conservatives call low income community members freeloaders. I don’t know. I appreciate the leanness of our state government and budget and I despise it. I appreciate the thrift and conservatism of state finances and yet I know it limits expanding services and access. How “bad” taxes are. Taxes pay for infrastructure and all the little parts of society most people take for granted. Roads, schools, libraries, first responders..the list goes on and on. There is not an American that has not benefitted from at least one of these things. Where does that money come from? Taxes. Yet we keep cutting taxes, grossly disproportionately for the wealthy and for large corporations, leaving the majority of the burden on low-income and working-class people. Taxes, themselves. Idaho’s taxes are some of the lowest in the nation, but that doesn’t stop certain legislators from constantly calling for personal income taxes and the corporate tax rate to be even lower. Idaho’s state budget is fairly lean as it is. The next time one of your representatives says they want to lower the personal income or corporate tax rate, please ask them where the cuts will come from or how the state will make up that budget deficit. I all but guarantee they will not have an answer. The liberal agenda and ideology that plagues our society and dominates an unregulated, out of control media. Cuts. We underfund education, transportation, and services that help our most vulnerable populations. Don’t give me another tax cut when we should be investing in our infrastructure, our citizens, and our future. Finding ways to fund things that help underprivileged people and people in need. We need things like affordable housing, community services, and public transportation! The fact that the legislature has consistently denied Boise the use of the local option tax to fund forward-thinking projects such as a light rail system. Idahoans fund their schools poorly, and a big reason for that is how the legislature appropriates money for school districts statewide. Not only is it not enough money, but rural and small population districts are poorly served. Evidence driven policies. The need for adequate funding for public transit to function and how that will make my day, your day, and our days better by reducing congestion and need for reliance on cars. Funding has to come from somewhere and LOT [(local option tax)]is a good option. The fact that Idaho GOP government continually underfunds every part of state government while giving tax cuts to rich people and corporations. Where our tax dollars go! Both state and federal, the proportion of taxes that go towards asinine things (like war, and subsidies for petrochemical companies) is jarring– and we just don’t discuss this as a society, especially in the context of our failing infrastructure, underfunded schools, dysfunctional healthcare system, etc. Taxes should go towards useful social services, not the destruction of our planet! Local option tax. 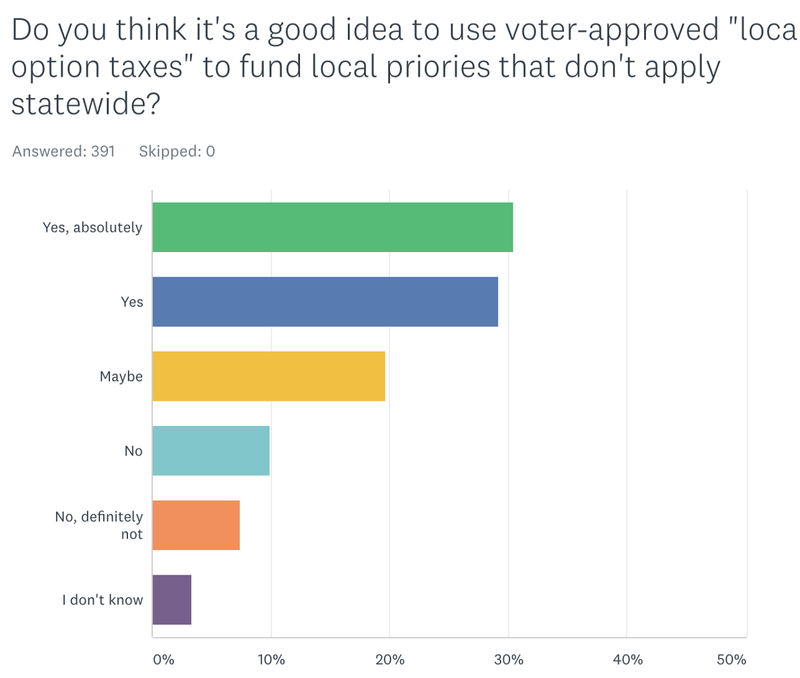 I feel like the people who know about it are passionate about it, but awareness of how a local option tax would work is not as widespread as one would hope. How badly a local option tax is needed! Rural areas have very different needs than urban, and both could benefit from enacting local option tax. Exactly where each tax dollar goes. It would be awesome to see a pie chart of “for every $1 you spend on Idaho state taxes, 20 cents goes to x, 40 cents goes to y, 10 cents goes to z” etc. Eliminating the grocery tax. 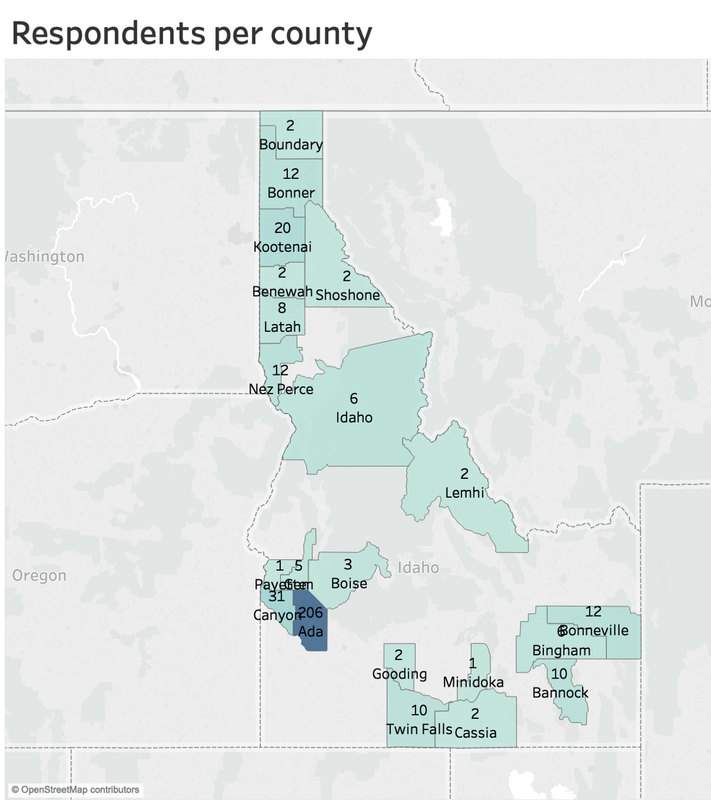 The grocery tax rebate is given to people every year who pay no grocery tax due to either traveling across state lines, every state that borders Idaho has no sales tax on food, excepting UT who has a reduced rate, or because they receive foodstamps, in which food purchases are not taxed. This means that people gain funds from Idaho, while never paying in. Eliminate the sales tax on food, eliminate the grocery credit and Idaho will find it has more funds in the coffers. Roads, school bonds and public services such as fire and police. If you want nice stuff then you have to invest in nice. The citizens of Idaho can’t have it both ways, don’t complain about bad roads, poor schools and crime without having to pay for nice and good public programs. Where to begin… first, the legislature likes to de-fund public programs for the express purpose of driving low wage individuals (the majority of this state) out to adjacent states where public services are more available, thereby saving the state money while reeking havoc on low income households. As a low wage state, fiscal conservatism tends to take on individual priority emphasis, when in reality, progressive taxation strategies would result in massive individual level benefits, especially in a low wage state, only spread out across the community in such a manner as to produce community level benefits that more indirectly benefit all individuals. Because the state is largely rural outside Ada County, this level of progressive taxation is harder to communicate on a state level. A local option tax would allow more progressive taxation in urban Ada County. However, rural legislators do not want to cede control to local Ada County, when they currently have a strangle hold on it by forcing it to operate as a rural community… to everyone’s loss (more tax revenues and better quality of life results in strong economic activity… education funding alone a huge net benefit). The incredibly terrible job the state does with Corrections. Talk about wasted taxpayer money. If you’re not going to actually bring correction and transformation to people whose crimes are so often the result of the trauma and neglect and poor opportunities they had growing up, then let’s just call it the Department of Incarceration. While Idaho is generally thought of as a “conservative” state, it actually has a fairly unfriendly tax environment. The income tax is steeply progressive, so much so that effective tax rates often are as high as those in well known high tax states such as California. Such a steeply progressive income tax structure is one of the factors why Idaho ranks 49th/50 in doctors per capita. Doctors who want to practice in a high quality of life area with great outdoor recreational opportunities find a better tax environment in nearby Wyoming or Montana. A the same time that the income tax structure punishes higher income families more than neighboring states, the sales tax on groceries amounts to a very regressive tax that hurts low-mid income families that don’t fall under the grocery sales tax credit program. This tax should be eliminated across the board IMO. That we have a state government that actually stretches our tax dollars pretty far…we have a better quality life with less taxes than other states (relatively speaking). Lack of funding in critical areas. Would be nice to see where we stand nationally on a list of funding priorities. Generally the press just reports on one at a time in an article on that particular topic. A more general article about what are taxes pay for and what the needs are would be useful. Idaho’s current tax structure is such that the an individual making around 11k (and filing as an individual) is taxed at the maximum percentage possible — 6.925%. Idaho’s tax brackets are extremely condensed in that everyone who makes less than 11k pays at varying percentages down to around 1.5k (between $0 and $1.5k is taxed at 0%). Idaho’s tax brackets are entirely in need of reform — there is no reason someone making 11k and someone making 100k or a cold million should be taxed at the same rate. Unfortunately, there seems to be a number of Idaho politicians and elected legislators who are opposed to any and all tax increases. We need a progressive tax system that is much more spread out and increases the percentage paid by those who make for instance, over 100k (I’m open to set the numbers where the research says we should). And to the extent it matters, I say this as someone whose pre-tax household income is over 200k. I’m ready to be in a higher tax bracket (10%!, 15%!, whatever) to make up any deficit that comes along with reform and moving the brackets so that someone making 11k is no longer taxed at the highest rate and is in fact, hopefully taxed at 0% or something much more minimal. Tax me, baby. The fact that more and more wealthy people are moving into our state, which drives up the cost of everything from groceries to housing for those of that are long time ID residents. It’s so bad that we are almost homeless and can’t afford to buy a small place out of town. I never hear about changes in Idaho tax code until after something has already been done. Apparently there was a tax break given to higher earners in Idaho, WHAT!?! Poverty. We have people who struggle and need healthcare, education, food, and housing. We should come together as a society to help our most needy for if we were in their shoes we would greatly appreciate help and do our best to give back to the society which helped us so much. I do not think the public realizes that all of Idaho’s cities have supported local option taxes for decades, but that the legislature has blocked any changes, and cities have given up trying. 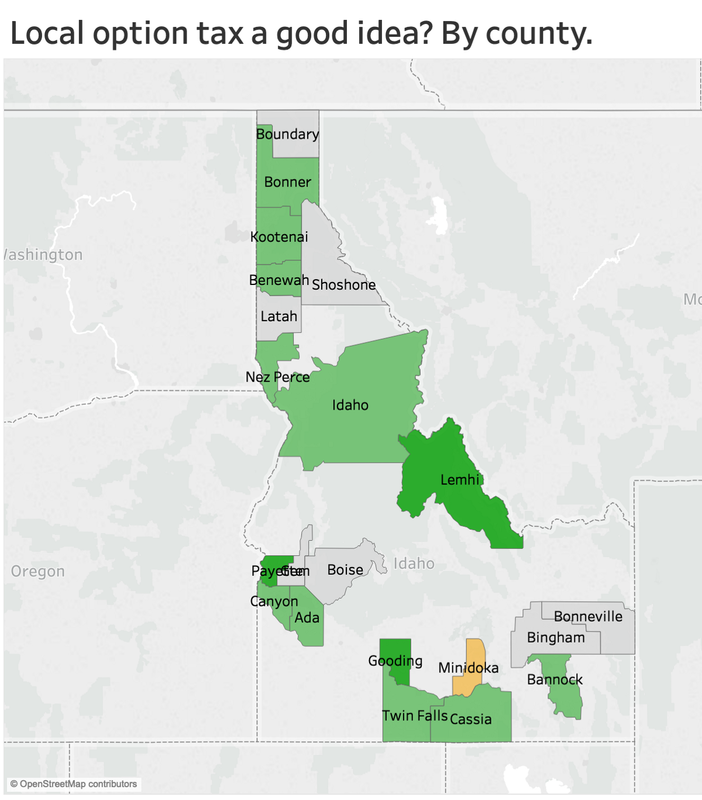 Our emaciated local news organizations don’t have the budget to research what that means for Idaho, by comparing to Utah for example, or pointing out the conflicts where Republicans are blocking efforts for true local control. This still image is for the cover photo. Gifs don’t work for that.